Well, from where I came from, our world ahd a lot of heroes. When the heartless came, we looked to them to save us--but one by one, under the pressure and simply the fact that htere were so few, all of the heroes died, and without our heroes to look up to, our world shattered. 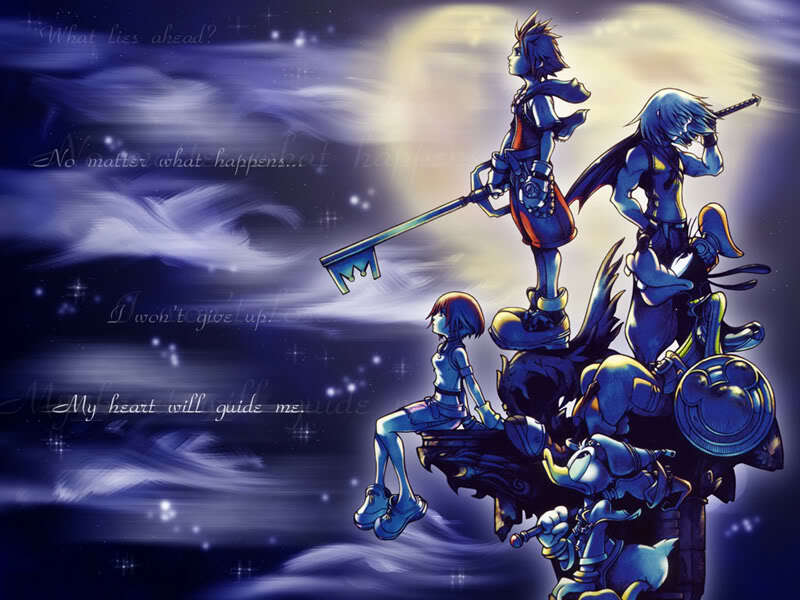 We were consumed by the Heartless...I think all worlds will be the same if we look up to heroes like the keyblade wielders. THey are powerful nad assets, but we can't jsut rely on them...they are not infallibe, and if we die, then we will lose hope. I think we should make our own hope and fight for our homes instead of just hoping the keywielders will save us. Continues looking at the intruder "Do what you want, i dont care what happesn to the worlds, im just in this to destroy as many heartless as i can...for takeing the one thing precious to me away....:"
"sorry i was invited here... but i can see that im not welcome... by the way... i have a warning for you....."
Glares at him "It dont matter who invited you! this is my house, only i am allowed to say who comes in and who doesnt! and i dotn give a crap about your warning"
Exactly, Sony...you are also not willing to just put your hopes on the keywielder. You can't just have some stranger avenge it for you. We need to avenge our world and defend yet-safe worlds with our own hands, with our own blades. You're not alone, Sony--there are many who wish to avenge their lost worlds, and if we work together, we can inflict our veneagence--twice over if needs be. Turns to the other guy "How do you knwo my name?? and i havnt lost any worlds...ive lost people...."
So have I. In my world, families are close knit communities. You probably know, as I do, how to lose each of tehm, one at a time, each a painful tear instead of a single slash that hurts a lot, but fades fast. Every time we think we can make it out, one of us dies, and turned into a heartless, nad we can only kill what used to be our loved ones. In the end, I and a few other soldiers from my world reached Traverse, but none of my family. You know how that feels, don't you? Continue to look at you ".....they wernt turned into heartless....i dont knwo what happend to them.....both o fthem....they were killed...jumpped....."
"alright then dude take it easy... "
turns and watches as the other guy turns, lowering my blade. They killed themselves rather than become heartless? That was brave. And it saved you the pain of killing them, knowing who they used to be. Now, I need your help in defeating hte heartless, to avenge each of our pain and to keep others from ever feeling it. looks at the ground, trying to surpress the memories again. "No...they didnt kill themselves....it was right here....i was turned the other way when they came up behind me, smileing...then she fell to the ground and all i saw was a black thing....then he went down as well....both of my friends....the were limp on the ground....they looked dead...but then some guy appeared...and before i knew it....they were gone....." looks back up at you "Im out to avenge their deaths...or find them if they arent dead.....but no thank you....youd just get in my way"
Pushes on talia, looking at the blade "What the hell you think your doing???" jumps back, takeing stance. Nothing...just proving you that we're better off working together, and perhaps I may not be hte only one who will just get in the way. Stares at his blade in the strangers hand "....youll get in my wat if you keep acting like this and stealing my blade....give it back....I wont fight you with that blade..."
"Ive got no intrest or reason to fight you, now give me that Sword back..."
Catches her and puts her back on his bealt and turns around, walking out of his own loft "Keep this junky place, i dont care, if your here, im not"